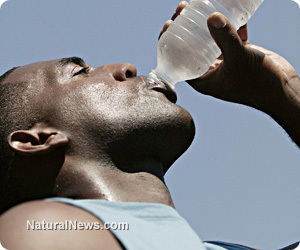 (NaturalNews) Americans everywhere are encouraged to drink half their body weight in fluid ounces in water each day or the proverbial eight eight-ounce glasses of water per day. Is it too much? Is it not enough? For answers, we turn to some basic aspects of human physiology. While water may seem perfectly pure and natural, you can "clearly" have too much of a good thing, and the side effects can be surprisingly nasty, and include numerous signs to look out for. We often hear that our bodies are made up mostly of water. While this is true, it is only a half truth, and it certainly isn't justification for blindly chugging as much water as you can stomach each day. In reality, the "water" in our bodies is not much like the water coming out of our faucets, found in bottles of Fiji, or coming out of home filters or distillers. The "water" in our bodies is more like soup, or seawater, or milk. A typical human body contains an estimated 15 liters of extracellular fluid, also known as interstitial fluid, which includes the blood. In order to maintain proper cell membrane strength, this fluid must contain a great deal of sodium. Inside of the cell, there is very little sodium and a great deal of potassium. The polarity of the dominant ions inside and outside of the cell (sodium vs. potassium) helps to keep fluids from flowing freely in and out of the cell. But a problem emerges when the extracellular fluid becomes too diluted with excess water to maintain this cell membrane strength. When this happens, water and the dominant minerals in the extracellular fluid such as sodium and calcium come rushing into the cell, causing it to swell, and triggering an activation of the sympathetic nervous system - or the activation of an acute stress reaction if you will. In turn, a myriad of symptoms can strike at varying degrees of severity. The most severe known manifestation of this occurring is known as water intoxication or hyponatremia, which can be deadly. The most notable symptoms include seizures and tachycardia or abnormal heart rhythms. • Blurred vision, mood changes, and other symptoms that many falsely believe to be "hypoglycemia"
While water is by all standards pure and natural, and certainly a better beverage choice than soft drinks and other sources of empty calories, you can definitely overdo it. Be very cautious about making the two most common mistakes - drinking when you are not thirsty as many "experts" advocate, and drinking for motivations other than thirst, as in drinking a warm drink to get warm or alcohol recreationally. Think before you drink. Matt Stone is the author and independent health researcher behind 180DegreeHealth.com In 2005, he launched a full-scale independent investigation into human health through disciplines as diverse as nutrition, exercise, the culinary arts and traditional agriculture, to paleopathology and psychoneuroendocrinology. It soon became clear that the typical ideas that the mainstream has about health don''t make much sense, are not congruent with history or even the most basic logic, and are often wildly misinformed. Thus was born 180DegreeHealth; the name implies both a 180 to our standard health advice and Matt''s aim of turning a 180 on the alarming health trends of today, including the dramatic and exponential rise of obesity, type II diabetes, tooth decay, crooked teeth, mental disorders of all kinds, autoimmune disease, allergies and asthma, heart disease, cancer, early puberty, and even nearsightedness. His pledge to readers is to provide the most logical, unbiased, worthwhile, effective, and accurate discourse on human health in existence. Follow along with him and his life''s work, and together, help build the foundation of knowledge and understanding required to improve our own health while we ensure the well-being of many generations to come. It''ll be a fun ride!